Arriving on DVD on April 28th is one of the best films of 2008. Nothing But the Truth directed by Rod Lurie was a critics and film festival favorite, but unfortunately due to the well publicized financial troubles of distributor Yari Film Group, the film was unable to secure a nationwide film release. The film bears a circumstantial resemblance to the Valerie Plame scandal, but is NOT based on those events. The piece is actually a character drama which explores the lengths that a journalist, played by Kate Beckinsale, will go to protect a source for an explosive political story. If you are unfamiliar with Rod Lurie's works, he is recognized in the industry for creating outstanding, story driven, character pieces, which is rare in today's Hollywood. His films such as the Academy Award nominated The Contender, Deterrence, The Last Castle and Resurrecting the Champ often explores the theme of standing by principles in the face of tremendous adversity. He takes that theme to the extreme here and has delivered arguably his best film ever. In the past, Lurie has been criticized for being too sentimental towards his protagonist. He avoids that trap here, maintaining an objective point of view. The result of his unsympathetic distance reveals fascinating portraits of morally imperfect characters in a harsh and cold legal world. The film is simply put, an emotional roller coaster with surprising plot twists and unexpected turns. The piece also features tremendous performances from the entire ensemble cast. The actors in this film unfortunately went unrecognized during awards season. Stand out performances were delivered by Alan Alda, Angela Bassett, Vera Farmiga and David Schwimmer. But the performances that stood out for me the most were Kate Beckingsale, Matt Dillon and Noah Wyle. Surprisingly, Noah Wyle seems to be transformed here and at times appears almost unrecognizable. His performance has a different spiritual rhythm and tone which hasn't been seen in his previous works. 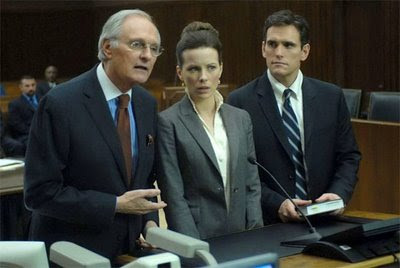 Matt Dillon, who is the traditional antagonist here, portrays a character whose working class roots shine through his high powered lawyer exterior. The performance reveals a humble, yet intelligent character who is surprisingly sympathetic. But make no mistake about it, the film belongs to Kate Beckingsale. Her character is simultaneously affable and stubborn, smart yet naive, strong yet vulnerable. The performance explores a character whose morals are tested in unimaginable and heartbreaking ways. The character's arc reveals a person who is so complex, that by the end of the film, even after experiencing her long journey and emotional turmoil, we haven't even scratched the surface of understanding her. It is beyond a doubt the best performance of Kate Beckingsale's career. The film will leave you debating and examining your own personal beliefs and morals for days after. The DVD features a commentary by writer/director Rod Lurie and producer Marc Frydman, deleted scenes and a behind the scenes special titled "The Truth Hurts: The making of Nothing But the Truth." Make sure to take advantage of this DVD release and catch this outstanding and little seen gem of 2008.